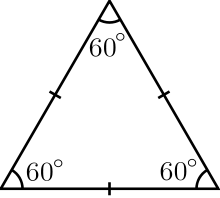 A while back I described a century-old geometry problem posed by the famous French mathematician Lebesgue, inventor of our modern theory of areas and volumes. • John Baez, Karine Bagdasaryan and Philip Gibbs, The Lebesgue universal covering problem, Journal of Computational Geometry 6 (2015), 288–299. As far as the math goes, it’s just high-school geometry. But it’s carried to a fanatical level of intensity, which makes it pretty interesting. 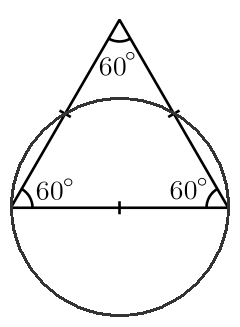 After all, two points in this triangle are farthest apart when they’re at two corners. There are lots of sets of diameter 1, so it’s interesting to look for a set that can contain them all. In 1914, the famous mathematician Henri Lebesgue sent a letter to a pal named Pál. And in this letter he challenged Pál to find the convex set with smallest possible area such that every set of diameter 1 fits inside. More precisely, he defined a universal covering to be a convex subset of the plane that can cover a translated, reflected and/or rotated version of every subset of the plane with diameter 1. And his challenge was to find the universal covering with the least area. In 1992, Hansen took these reductions even further by removing two more pieces from Pál’s hexagon. Each piece is a thin sliver bounded by two straight lines and an arc. The first piece is tiny. The second is downright microscopic! But this picture is not in scale! In fact the smaller region, T’C3V, has length 3.7 · 10-7 and maximum width 1.4 · 10-14, tapering down to a very sharp point. That’s about a few atoms wide if you draw the whole hexagon on paper! And it’s about 30 million times longer than it is wide. This is the sort of thing you can only draw with the help of a computer. it does seem safe to guess that progress on [this problem], which has been painfully slow in the past, may be even more painfully slow in the future. 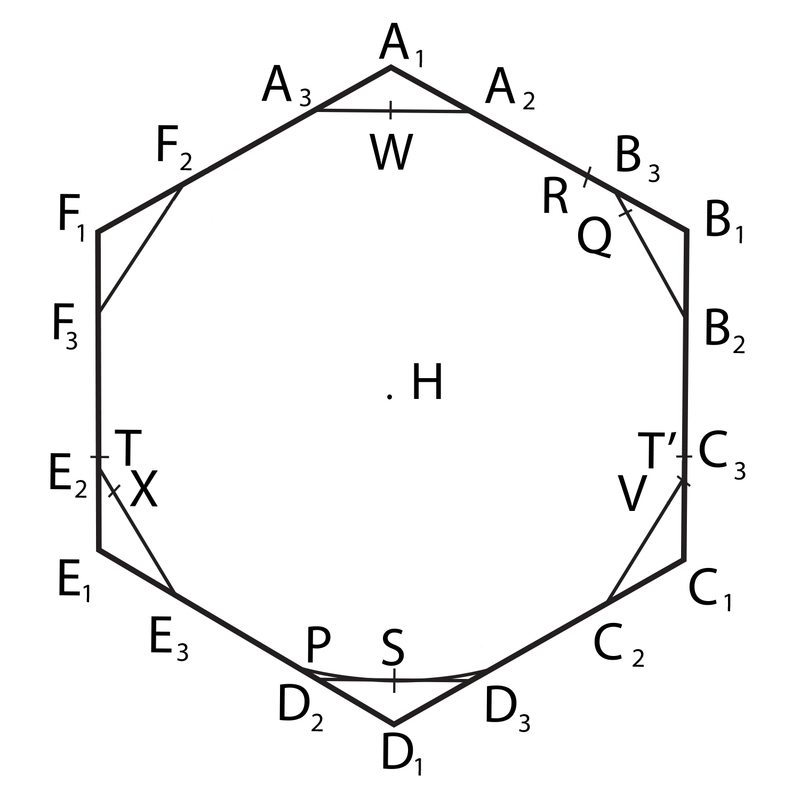 The key is to slightly rotate the dodecagon shown in the above pictures, and then use the ideas of Pál and Sprague. So, one way or another, we can expect a lot of progress now that computers are being brought to bear. • Philip Gibbs, Java program. • Philip Gibbs, Java program output. and as explained at the end of our paper, the best rotation angle is about 1.3°. This entry was posted on Tuesday, February 3rd, 2015 at 10:57 pm and is filed under mathematics. You can follow any responses to this entry through the RSS 2.0 feed. You can leave a response, or trackback from your own site. John Baez, Karine Bagdasaryan, and Philip Gibbs improve the Lebesgue Universal Covering problem by over a million times (2.23 x 10^(-5)) to get a new area of 0.844137708426… ! They invite you to check their work and note it will be much easier if you are very good at programming! On page 2, you write “best previous lower bound, due to Hansen”, but this seems to be an upper bound. Yes, thanks! I’ll fix that. Congratulations! As a bonus, if none of you hears strange noises in coming days that kinda puts the kibosh on certain paranormal theories (any ectoplasmic embodiment of Martin Gardner’s spirit would clamor for details). In the second-last sentence of the paper, should “We could obtain a larger area if σ were smaller,…” instead be “We could obtain a smaller area if σ were smaller,…”? In the second-last sentence of the paper, should “We could obtain a larger area if σ were smaller,…” instead be “We could obtain a smaller area if σ were smaller,…”? I reconstructed the geometry for your final cover in Mathematica, and I get the same results for area as a function of the angle σ as you do. i.e. there’s a triple 7 in the paper where it should be just a double 7.
where the double 4 has become a triple 4. Wow, that’s amazing! You’re the first person outside the team to actually check our work. Thanks for catching those stupid typos. Those are my fault, and it goes to show (yet again) that errors easily creep in when copying things by hand—a lesson I should have learned by now. But thanks much more for redoing Philip’s calculation! That’s truly heroic! Could you mail me the Mathematica program? I guess you can send it to me as a “notebook”. I can put it on my website and include a link to it in the paper, saying you used it to check our work. That way a referee of the paper, or any other interested party, will have another way to check our work. 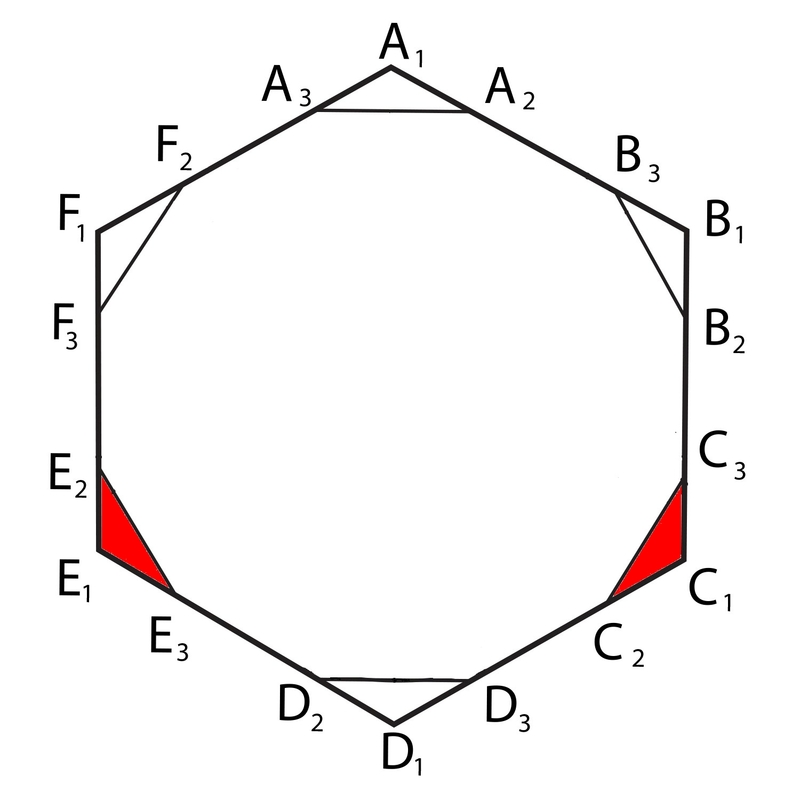 • Greg Egan, Gibbs–Bagdasaryan–Baez reduction: Mathematica notebook. • Greg Egan, Gibbs–Bagdasaryan–Baez reduction: Mathematica printout. I’ve updated our paper to refer to these. More mathematics papers should use the word whopping. • John Baez, Karine Bagdasaryan and Philip Gibbs, The Lebesgue universal covering problem, Journal of Computational Geometry 16 (2015), 288-299. The referees caught a number of mistakes, so if you ever got ahold of an earlier version of this paper, and if you care, please get the new one. The journal is open-access, so it’s free. Oh, whoops! I forgot I removed the word “whopping” when I submitted the paper — feeling a bit nervous I guess. If I’d been clever, I would have re-inserted it in the final version. This is an improvement of 2.178245 × 10-5 over our earlier work—roughly equal to our improvement over Hansen.